Designing a custom outdoor kitchen involves a lot of decisions, from the layout and appliances you want to the colors and finishes you like. You want this to be an outdoor living space you can enjoy for years to come. One thing that can seriously impact how much time you spend outdoors is shade. You probably plan to spend time in your custom outdoor kitchen enjoying the beautiful Colorado weather, and the right shade fixtures can help make your space more comfortable for all hours of the day. 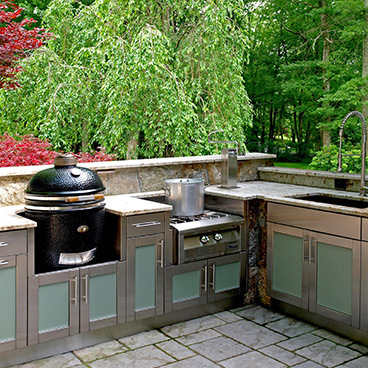 Read on to explore your options, and contact Artisan Outdoor Kitchens today to discuss your outdoor kitchen design! We are dedicated to helping you build the outdoor living space of your dreams, and our team is here to make recommendations based on your needs and expectations. One of the things that draw people to Colorado is the 300 days of sunshine a year. It can make spending time outdoors especially nice, but it can also be a drawback. When entertaining family or friends in your outdoor living space, you don’t want them to bake in the sun. With the right fixtures, you can help them stay cool, avoid sunburn, and enjoy their time outside. Fortunately, you have many options to choose from, so you can find a solution that perfectly fits your custom outdoor kitchen design! 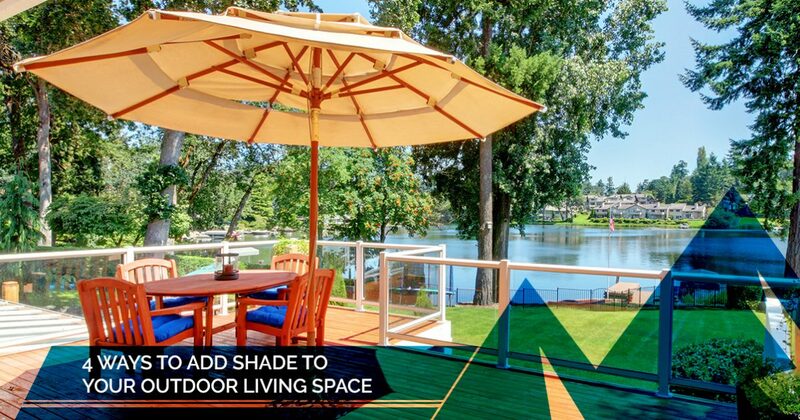 One of the simplest ways to provide shade for you and your guests is to add an umbrella to your outdoor living space. If you already have a patio or a dedicated seating area, then you may also already have an umbrella for your guests. You may want to consider adding one to your custom kitchen design to offer the chef shade as well, although you have to be cautious in where you place it. As we mentioned in our last blog, there are several fire hazards you need to keep in mind when designing your outdoor kitchen, and a badly placed umbrella will only add to the risk. If your outdoor living space is close to the house, then an awning is an easy renovation you can make. It can provide shade when you need it, and retract when you want to enjoy the sunshine. There are a lot of style and color options to choose from, and the team here at Artisan Outdoor Kitchens would be happy to help you decide what would work best with your custom outdoor kitchen design. A pergola is a lattice roof supported by pillars that you can build around any patio or seating area. 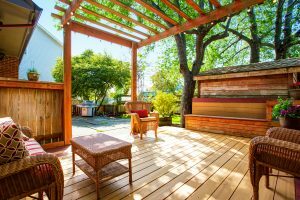 It can be constructed to your specifications, so whether you want a small shaded area over your outdoor kitchen or you want a pathway leading from your home to your outdoor living space, a pergola can meet your needs. It offers shade without the confines of a solid roof or awning, and many are used as a framework to train growing vines for an added touch of natural beauty. If you are looking for a truly green way to provide shade for your outdoor kitchen, then you may want to consider planting trees. It may take a few years for them to reach maturity, but it’s a long-term investment that can be a beautiful addition to your landscaping throughout the year. If you already have trees you can utilize, remember to keep them trimmed. As we touched upon earlier, it’s important to keep flammable materials away from the heat sources of your outdoor kitchen, like the grill. The team here at Artisan Outdoor Kitchens is here to help you choose every element of your outdoor living space, from color and style to shade fixtures and the appliances that make up your stainless steel outdoor kitchen. Umbrellas, awnings, pergolas, and trees are all possibilities we can discuss to ensure that the final product is an outdoor living space you’ll love for years to come. 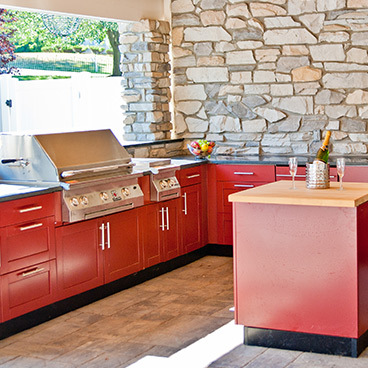 For more ideas and inspiration, visit our outdoor kitchen design page, and contact us today! We pride ourselves on bringing your dreams to life, and we won’t stop until you’re satisfied. Call now to get started!